I walked along the beach smiling and squinting at the girls. One of them smiled back. A rasta girl had an old dog that looked a little like a chocolate a lab and we started to talk. She was not bikini clad, but rather wore beat up flower clothing from the 60s. She sat next to a guitar and well worn travel bags. We shared supplies for dinner and I learned Asha's story. Asha met her dog at a pound. Clove's eyes connected with hers and it was love at first sight. Asha and Clove left home to travel the world she took her guitar and camping equipment with her. Their last 100 dollars was stolen in Mexico. After that they supported themselves with street corner concerts--she writes her own music--and selling handmade jewelry knickknacks. They made it to South America and then, somehow, over to Europe. They hitchhiked through Germany, Switzerland, Italy and Greece, where they settled in a valley next to a Cretan stream. Their epic journey had brought them to a place of nymphs, fairies, and sprites, a place where a dog could grow old and be happy, and a young woman could while away her days tending a wilderness garden as the last free spirit. Things were good, until she brought food to a friend in jail and was incarcerated herself for overstaying her visa. She did not speak Greek and was unable to order her food over the phone as the system provided. As a vegetarian she would not eat the meat spaghetti the church occasionally brought. For four days she was very hungry. Then she was expelled to Turkey. She found her way to the mountains around me a week ago and made camp in the woods. This morning, Turkish soldiers broke up her camp and threw her out. Her dog is old and they're looking for a place to settle down. Maybe if they can make it back to the EU, where there's more money in street concerts, they can save up enough to get to South America where life is good. Asha made camp on the beach a few hundred meters from me. We had breakfast together and she insisted that I take her ginger, walnuts, and fruit with me. I steadfastly refused so she hid the supplies in one of my drybags. I connect with walnuts. The story is that grandpa Sam was so strong he could crack walnuts with his bare hands, so they make me think of him. I paddled past pristine beaches and 2000-meter forested mountains just over the water. I explored a sea cave with a single chamber large enough to fit half a dozen elephants in a circus pyramid. The sky was dark and the tail wind grew strong and even became a little uncomfortable. I paddled along a beach just outside the surf zone. I expected to find a river mouth with a couple of bars a short paddle inland if I decided to stop early. Suddenly I was in the surf. A wave one and a half times my height broke and rammed my starboard side. I leaned into it, sculled, and used the bursting foam to support my weight. I must have been near the river mouth, but without my glasses I wasn't sure. I fought to get out of the extended surf zone, and was hit by a few more waves, but nothing as big as the first. With the surf behind me, I squimted out the shape of cyclists just behind the beach. Cool, my triumph over the sea had been witnessed. I arrived in the port and climbed out of Icarus into shallow water. I picked her up by the bow and stepped onto a ramp, pulling her with me. My second step slipped out from under me. I dropped her onto the concrete with a bang. As I fell my camera jumped out of my jacket pocket, hit the ground, popped open and into the water. On my hands and knees I slid down the slime to the bottom of the ramp. My pride was shaken. My hull was dented, but nothing I couldn’t repair. My camera was full of salt water, and no amount of dry rice could save it. The port was not a hospitable place. Showers cost eight Turkish lira ( ~ $4). There was an unused stand that would have been perfect for me to fix my boat on, but the coast guard wouldn't let me, or even take the time to let me explain. I wandered over to a water sports center, where I was greeted like a king. I could sleep there overnight, for as many days as I like. They would feed me and be happy to give me the eight lira for a shower. I met a Saudi Arabian trio, a younger man and an older couple, who had just finished a ride on a speed boat. The woman was wearing a conservative Islamic outfit and headscarf. My hosts told them my story and they were impressed. The wife explained to me that even though they were very wealthy, the husband walked everywhere. In fact, now he's famous for it. They were really impressed by my trip. Later, while I was eating dinner, he walked over and handed me money. I thanked him kindly and counted 200 Turkish lira after he left. That was a lot of cash to be handed. They were having dinner some 50 feet away so I walked over to thank him again. He, and the other two handed me more money and we talked, smiled, and took pictures. The younger man asked me what religion I was, "Christian?" The woman nearly screamed, desperately hoping she had misheard me. The younger man asked again. The older man stepped in. "Great! We're cousins. We are from Ishmael and you, Isaac. We shook hands like long lost family and after another picture, I politely made my escape. I woke rejuvenated after an evening of good company and launched onto glassy clear waters. Someone was playing with explosives far out to sea. My rhythm was set by booms rushing over the water. I had planned to camp tonight after a long crossing, but a headwind forced me towards land early. I passed a gun boat and didn't take a picture because I don't want anyone asking to see my visa, and found a shower. It was in a protected clear blue bay behind a small tourist bar hidden in a wilderness. The abundant women here are beautiful and wearing bikinis. My glasses are at the bottom of the sea. I guess I left my super powers behind in the Aegean. Beloved reader, my computer broke a few months ago and my smart phone yesterday. Sadly, baring a substantial jump in contributions and a corresponding new piece of technology, my blogging will stagger or cease all together. 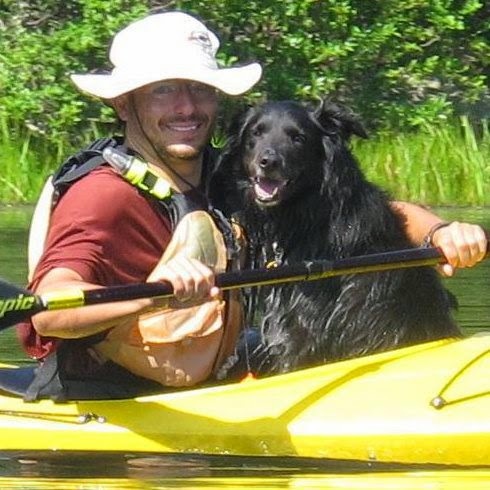 The good news is that I will keep a journal and my stories will likely be available in my upcoming book, tentatively named, The Theseus Kayak. Thank you all for coming with me this far, go now and embrace life. It's wrong to strike at someone's dignity because of their sexuality, since one has nothing to do with the other. Every human on God's green earth should be able to marry whomever they please provided 1) The couple shares a mutual loving relationship. 2) You may not marry a sibling, descendant, or ancestor - unless time travel is involved. 3) You may not marry your cat. Last night I found wifi and an electrical outlet behind a closed beach bar. After a couple of hours the owners found me and chased me away. The hotel staff that was working on the beach brought me 12 liters of 750ml bottled water before my launch even though I'm happy to drink from the tap. A little dysentery now and then makes a fellow strong. I appreciated the gesture. They waved to me as I paddled away and I gave a goodbye roll. I packed the extra water in my 10 liter bag so that I could camp for the night, halfway to my next supply point. The larger than usual water bag displaced my bread bag, and I had to smush it under my leg rather than balance it between them. I don't know if it's because my cockpit is leaking or if it was water that I took on during the goodbye roll, but my bread got soggy. Yuck. I still had the chia maca drink. It got me about half the distance I needed to paddle for the day. I could camp, but the only place to resupply tomorrow was in the wrong direction. I found a deep sheltered bay and got directions to the nearest restaurant-market, a mere ten miles crossing in the right direction. I set out, into a sudden strong headwind, paddled for ten minutes, and turned around broken before the tears came. Back in the bay there were four sailboats. I asked for supplies and got invited for tea onto a double masted sailing yacht. I climbed up the ladder and Jan, my welcoming host, introduced me to his friend Sven. "Well Hellooo!" Sven said with a strong effeminate intonation. After tea and regaling the party of 11 happy Dutch sailors with stories I got to shower. Sven lent me his comb to work the budding dreadlocks out of my hair. It was a loud painful process. Sven offered to comb my hair for me but I, a bit too quickly, declined. Later, while we drank wine and beer I learned more about my hosts. Sven's husband was Jewish. There were two other married gay couples on board, Jan who was throwing the week long trip as a 74th* birthday party, and a number of single women. Everyone was over 60. Apparently Sven had previously worked as a hairdresser and it was in that capacity that he had offered to comb my hair. After drinking was dinner with more wine and singing. There were lots of yummy salads. Thank you Jan for a wonderful rejuvenating evening that I will remember as one of the highlights of my trip. On the pristine beach I slept like a king. * I want to stress here that some of the names and numbers are only half remembered from a long joy filled evening. I set out due east and paddled 19 miles on the same bearing with a tailwind. At my midpoint, the nearest land, a few miles off, was a small island at the head of three bays. I was getting tired. The last of my gogo juice tasted off, probably from the heat. I forced it down and immediately regretted it. My last two miles were mired in sea sickness. A vast beach spread out ahead of me. Wind surfers were flying off waves and banana boats were zooming around. I don't get banana boats. Apparently my stop for the night is a popular tourist hotel destination. I don't have a room and the security people and staff don't seem to want me around. No, I may not use the wifi. Hopefully they won't trouble me after they realize I'm sleeping here. I found a tree with sweet berries growing in the higher branches, so I climbed it and gorged myself until my fingers were purple. Yummm. I paddled on glassy waters under orange and red speckled cliffs. I only had a short distance to go, so I took the time to explore the nooks and crannies of the coast. I was rewarded with a crack in the rock that turned out to be a sea cave. Çiftlik Coyu is a tiny collection of houses and restaurants on an island-protected bay. Sailboats and calm waters are surrounded by steep hills and the sandy beaches are warm and bright in the sun. Hot showers grow on trees and smiles abound. It's a wonderful place to spend the Sabbath. After a last desperate losing battle with customs I launched with my new gear and left Greece behind. The sea was calm and I passed and waved to several sailboats as I crossed to Turkey. Once I rounded the headland the strengthening beam wind turned into a tailwind and I made good time. But I was drinking potato soup instead of chia maca gogo juice and I was tiring. And I also had to poop. At 16:00, still 10 miles away from my destination, I headed into a beautiful bay at the edge of a thickly wooded ravine. There might be spots of fresh water in the otherwise dry stream bed. Near the beach I found a shallow well with a few inches of clear sweet water and a pile of donkey poop. I could beat into the bush and climb up the stream bed or paddle out to the moored sailboat and ask for drinking water. The boat flew an American flag. One of the sailors even spoke a little English and they were happy to provide me with some bottles of water. The bay was protected by an island and I went through my repertoire of rolls on the pristine water. While I was training in Symi I was very pleased, after years of working at it off and on, to get the hang of a reverse sweep roll. I remembered long ago drills and a brief lesson given to me by the kayak wizard Jack Gilman, and with his teaching, lots of failed attempts, and warm water I finally got it down. In the wilderness bay I also performed on both sides my C to C, sweep, butterfly, shotgun, and crook of elbow rolls. Up next, spine roll. Sadly, I've lost my once reliable hand roll, but hopefully it will be easy to remaster once I have a wide repertoire of Greenland rolls. I lay down on the beach and was asleep as soon as my head hit my life jacket. Symi was the domain of King Nireus. He loved Helen, so when the time came, he joined the campaign against Troy. His renowned good looks did not protect him. He died in battle for love. I have now spent a number of days in Symi. Much of that time has been used to write and edit pictures. Maintaining my blog is hard work, but I do so hoping my readers will contribute and make finishing this quest and starting the next one in good time a reality. I've also been working on my Greenland rolls, mending my life jacket and pants, bleaching my water bag, washing my clothing, patching my water bag and generally getting overdue logistics done. Hopefully my negotiations with customs are at an end and I will receive my package on the island's mail day, Wednesday. Theseus's ship was damaged in battle, and some of the boards needed to be replaced. The vessel hit a sandbar, and some of the boards needed to be replaced. There were termites, and pirates, and sea monsters, and so many of the boards had been replaced that Plato wondered if it was still the same ship or an entirely new vessel. I repaired 16 leaks in my hull and gunnels over three sessions during my stay. Most of them were the result of old patches degrading; so I sanded, taped, and epoxied. I'm using a new kind of repair goo, hopefully it will last longer. I met a man who liked my shoes, or lack thereof. "My family is called the shoeless family. I remember my grandfather. He climbed all the mountains on the island with a pair of hiking boots slung over his shoulder. He lived to be 99." The Aegean resonated in his bones. I called FedEx to change the package destination to future Greek islands. I hate waiting like this. They can't do it. The courier that they are committed to work with, unlike the Greek post, does not deliver out there. I came up from a reverse sweep roll. My glasses were gone. The fact that I was sure I tied them on didn’t make them less gone. The wind was pushing my boat, so I looked around and set boundaries for my search area. I was about 30 feet from the beach and the crystal clear water was maybe 15 feet deep. 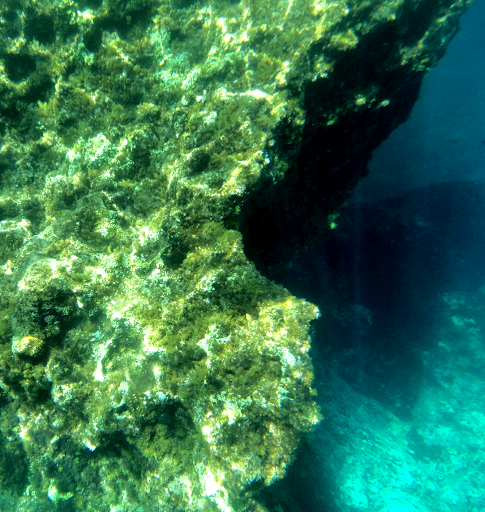 The sea floor was covered with algae growing rocks. I beached my boat and dove. From up above I hadn’t realized how many fish were swimming down there. When I came back up I saw a dinghy was carrying a couple crewmen from a luxurious double masted sailing yacht to shore. I called to them and explained my problem. Soon after they returned with a snorkel mask, flippers, and Piere. Pierre and I searched for the glasses. We swam on the surface and dived down until I was so cold I was shaking. We didn't find them. My vision is -2.25. I hope that's good enough to safely finish my trip. The sun shone and the water was the calmest I've seen it since before the Aegean. A new chapter of my quest began. I paddled along the coast of Turkey. The mountains above me were a blend of sweet smelling forest and scrub lands. I entered a cave and paddled a hundred feet into the side of a mountain, then used my hands to pull myself 50 more. The tunnel was dark and tight; I chose not to go further without a headlamp. Hopefully I will soon be receiving one in the mail. I crossed six miles to Symi, my last Aegean island. The town of Ano sits on a wide natural harbor with a view of red and purple Turkish mountains. The harbor is surrounded by steeply climbing pastel and stone houses. It's the tourist season and services like wifi and showers are largely only available to people with money. It is not a welcoming place, but somehow I've been conned into waiting here for my package of emergency gear. Hopefully it'll come soon. I did find one bar that's friendly, so if you make it here to Symi stop by Φωτεινη διαδρομη.